This year, ever since going back to veggie in summer, I’ve been experimenting with adding some whey protein to my food, because I just wasn’t getting enough protein for my level of training from my vegetarian diet. (My IBS-prone system puts a limit to how many pulses I can eat…) I’ve discovered a surprising number of tasty ways to add protein powder into my diet – because I’m not a fan of the shake – and throwing a scoop into my morning porridge is one of them. It has the added benefit of making this porridge super filling, so I don’t even feel the need to snack until lunchtime. So here’s my new favourite porridge! Peel and slice the banana. Set one half aside for the topping. The other half will be cooked in the porridge for extra flavour and creaminess. Put all the porridge ingredients (except the vanilla protein) in a small pan and cook until the porridge has your favourite consistency. When the porridge is ready, add a scoop (or half a scoop) of vanilla protein and whisk until it has dissolved. If the consistency gets too thick, add a splash of hot water. 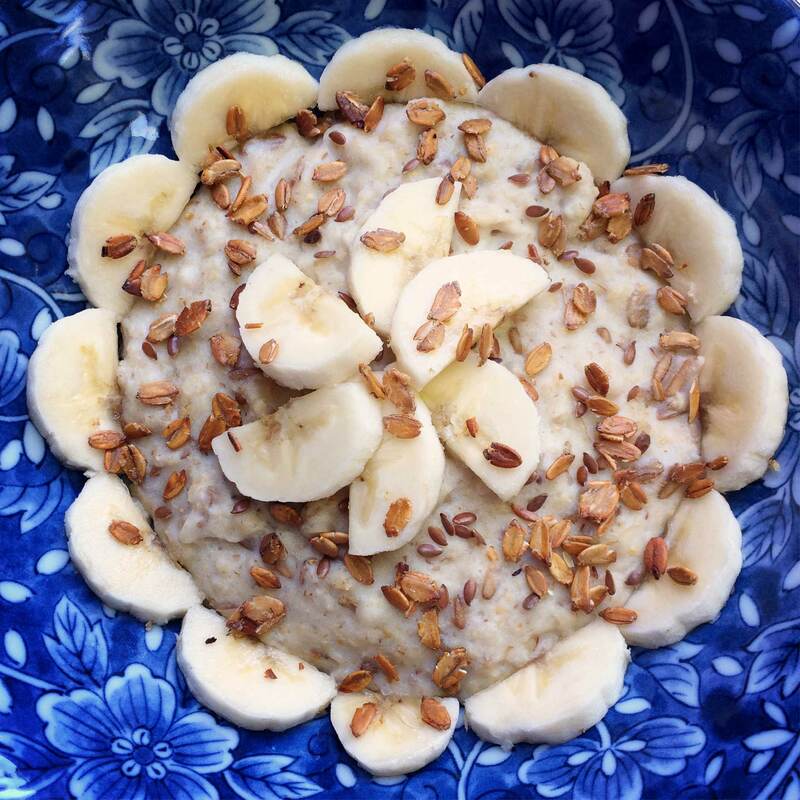 To serve, put the porridge in a bowl, top with the remaining banana and sprinkle the linseed and crispy rye flakes on top.